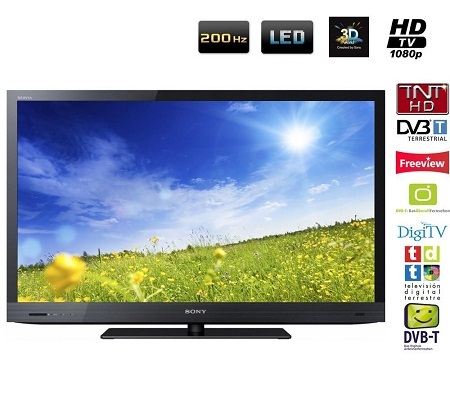 Sony Bravia KDL-40EX720 is a 40" 3D LED TV with Full HD 1080p picture quality which is just perfect for home cinema. Watching movies on this TV is a real pleasure. Entertainment lovers, the slim Sony® EX720-Series LED LCD HDTV is for you. See precise motion detail plus watch your favorite 2D or 3D entertainment in clear, vivid Full HD 1080p picture quality with incredible contrast.4,5 Instantly access must-have entertainment on your terms including movies, TV episodes, videos, music and more. You also get new apps delivered automatically – so your selection is never outdated and you are always connected to the best entertainment.2 You can even video chat with friends and family when you Skype on the big screen. Enjoy a vivid, lifelike picture experience. Sony’s X-Reality engine brings out the best by analyzing each scene so you see sharpened images, and amazing contrast detail. Experience the next level of picture quality and contrast with Sony’s Edge LED Backlight technology. This technology sharpens image contrast giving an amazingly crisp picture you can see. The ultra-thin backlight system allows for a slimmer, sleeker design. Save energy when you’re not around. The television’s built-in motion sensor has the ability to scan the room and detect movement. If the sensor detects no movement it automatically turns off the picture leaving only sound. After more time and no movement, the TV turns itself off minimizing any unnecessary power draw. Share your photos on the big screen or listen to your favorite music. Simply connect your digital camera, USB-enabled MP3 player, or USB storage device directly to your HDTV's USB input. Conveniently operate and control other BRAVIA® Sync™ compatible devices - including BRAVIA® HDTVs, Blu-ray Disc™ Players, surround sound systems, Handycam® camcorders and Cyber-shot® digital still cameras, all with one remote control. Sony Bravia KDL-40EX720 is a good sized TV, full of features and it is priced well. We recommend it.